Infinity and beyond: Life on the edge at your personal infinity pool at La Casa Que Canta. The couples who have been retreating to La Casa Que Canta resort for the past decade might not forgive us for sharing this, but we can’t help it: The romantic 24-room hideaway on Mexico’s Pacific coast shifts from tempting to irresistible this winter, with the addition of El Murmullo, a new three-story, four-bedroom luxury villa built into the cliffs overlooking Zihuatanejo Bay. Unless your name happens to be Bill Gates, a stay here is going to count as a splurge (it’s $4,000 a night, including two gourmet meals a day for up to ten people), but believe it or not, it’s worth it. The roomy stone-and-stucco guest suites are outfitted with sunning terraces and outdoor Jacuzzis, marble walk-in showers overlooking the water, and bed linens decorated daily by hand-laid flower petals. Downstairs is a cozy library, an open-air living room with a lofty wood-beam ceiling and Mexican artifacts, and a private infinity pool with a swim-up bar, where your personal butler awaits your drink order. Traditional Mexican cuisine is prepared by your personal chef and taken in a palapa-roofed cabana that juts out over Zihuatanejo Bay; be sure to request the lime pancakes. If you insist on keeping busy, there’s fishing, snorkeling, diving, shopping, and a low-key nightlife scene in town, a short drive away. Or you can sit on the beach at sunset and watch the pelicans dive into the sea. 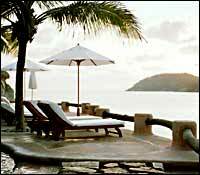 Aeromexico (800-237-6639) flies from JFK to Zihuatanejo, with a stop in Mexico City. * New York Metro is not responsible for the services and information provided by these sites. Sites were chosen based on the type of information provided and were not further tested.